1. River Irrawaddy - Originates from the southern slopes of Mount Khakabo Razi, It is the largest River of Myanmar which is known as ‘The Lifeline of Myanmar’. Mandalay city is situated along its banks. The area lying between Irrawaddy and Chindwin Rivers is famous for the production of Cotton. The deltaic part of Irrawaddy and Sittang Rivers is famous as ‘The Rice Bowl of Myanmar’. 2. River Salween - It is the major river of eastern part of Myanmar which after originating from south-eastern Tibet, flowing through the Shan Plateau, moves in southerly direction and drains into Gulf of Martban. It is the longest river (2090 km) of Myanmar. It is navigable upto a distance of 110 km starting from its mouth. Flowing through narrow passage, it makes rapids and waterfalls at various places. 3. River Chao-Phraya (R. Meenam) - It is the major River of Thailand. The capital city Bangkok is situated along its banks. Despite being small in size it is very useful for water transport. It, however, is highly polluted because of the discharge of liquid and solid wastes in the river by the inhabitants of Bangkok. Its deltaic parts produce the world’s best quality rice. The population density of its deltaic part is very high. 4. River Mekong - It is the largest River of Vietnam. Its source is in Tibet. It is the longest river (4160 km) of south-east Asia and passes through and makes boundary between various countries. Therefore, it is also called as ‘Danube of East’. Phnom Penh and Ho-Chi-Minh cities are situated along its banks. The Mekong Valley of south Vietnam is the major area for the production of rice. It is also called ‘Ganga of Vietnam’. 5. River Red (Song Koi) - It is major river of North Vietnam. It primarily flows in a narrow valley due to which its extension in plains is very limited. Hanoi city is situated along its banks. River Black is its major tributary. Its deltaic part is famous for the production of Rice. 6. River Si-Kiang - It originates from eastern Yunnan area of China and drains into South China Sea. More than half of China’s silk is obtained from the deltaic part of Yangtse-Sikiang Rivers. This river basin has high population density because this basin is highly fertile. 7. River Chindwin - Chindwin is the main tributary of Irrawaddy River, flowing in Myanmar. It merges into the Irrawaddy to the north of Yangon (Rangon). Its basin is known for the cultivation of Rice, Maize, Millets, legumes and vegetable. 8. River Irtysh - Orginates from Altai Mountains, it is the main tributary of the River Ob of Siberia. The city of Omask is located on its bank. The soil in its basin remain permafrost. 9. River Hwang Ho - This great river originates from Plateau of Tibet and drains into Yellow Sea. This river takes along with it the yellow muds which come after flying from the Loess Plateau. Therefore, it is also called ‘Yellow River’. It is famous for changing its course due to which floods occur usually. Therefore, it is also called ‘Sorrow of China’. Due to large scale deposition of sediments, its delta is moving towards the sea. This is the second largest river of China. 10. River Yangtze (Chang-Jiang) - It is the longest river of China and fourth longest (6299 km) river of the world which originates in Tibet and drains into East China Sea. Shanghai and Wuhan are the major cities situated along its banks. The ‘Three Gorges Dam’, the world’s largest hydro-electric project, is being constructed on this river. It has served as a major waterway for centuries. Its delta spreads over an area of nearly 2,00,000 sq. km, whose 70% part is used for agriculture. 11. River Yalu - It forms a natural boundary between North Korea and China. It falls into Yellow Sea. It originates from Manchuria region of China. 12. Amu Dariya and Syr Dariya - Two major rivers of Central Asia, which flow through semi-arid desertic area and fall into the Aral Sea. The water of these rivers are dammed to provide irrigation to the desertic parts. The Amu Canal irrigates the desert of Turkmenistan and finally takes the water of Amu River to the Caspian Sea. Syr Dariya water irrigates the Fargana Valley while its tributes irrigates the Tashkent region of Uzbekistan. 13. Tigris-Euphrates River - These two major rivers of Iraq, which after flowing in south-east direction drain into Persian Gulf. Shat-at-Arab in Iraq is the area of their confluence where the only port city of Iraq, Al-Basrah, is located. These rivers have produced extremely fertile valley which is famous by the name of ‘Plain of Mesopotamia’. Their doab is famous for high fertility. Shat-al-Arab region is world famous for production of date palm. The Mesopotamia civilization flourished in their valley. The cities of Mosul, Baghdad and Al-Basarah are located along its banks. The Euphrates is the main single source of water for the domestic use, irrigation and industry. Tigris is also known as the ‘lifeline of Iraq’. 14. River Ob - Originating from Altai Mountain and draining into Gulf of Ob, it is the second longest river (5570 km) of Russia. It flows in West Siberian plain. It forms swamp or marsh at its mouth because its mouth freezes in winter. Its important tributaries are lrtysh, Tobol and Ishim. The industrial city of Novosibirsk is located on it bank. 15. River Lena - Originating from Lake Baikal and draining into Arctic Ocean, it is the third longest river (4400 km) of Russia. It forms swamp at its mouth because its mouth freezes in winter. 16. Third River - A vast drainage canal in Iraq midway between Euphrates and Tigris Rivers. It was designed to reclaim the saline affected area. 17. River Yenisey - Originating from the Tanuala Mountain and falling into the Arctic Ocean, it is the largest river (4989 km). of Russia. 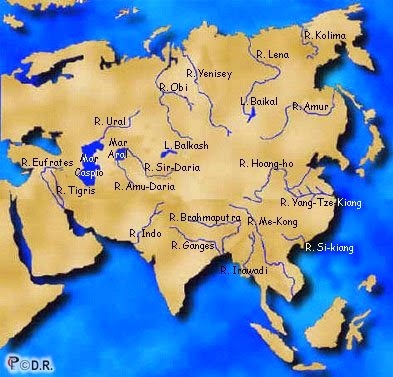 Tunguska, Angara and Salegna are its major tributaries. It forms swamp at its mouth because its mouth freezes in winter. 18. River Amur - Originates from the Plateau of Mangolia. It flows in far east region of Russia and is 2824 km long. It falls into Pacific Ocean. The cities of Chita, Khabarovsk and Komsomolsk are situated on its banks. Sugari and Ussari are its important tributaries. It makes international boundary between China and Russia. 19. River Indigirka - It flows in far east region of Russia and falls into the Arctic Ocean. It form swamp at its mouth because its mouth freezes in winter. 20. River Kolyma - After originating from Kolyma Range, it falls into the East Siberia Sea. It remains frozen during the greater part of the year. 21. River Ural - After originating from Ural Mountains it flows in southern direction and makes boundary between Asia and Europe before draining into Caspian Sea. Because of this, the salinity of the Caspian Sea has fallen. It is a major river of Russia. 22. River Brahmaputra - It rises in Tibet from the Chemyungdung Glacier. It is known by various regional names. Before entering India, it is known as ‘Tsangpo’ in Tibet. It enters Bangladesh near Dhubri where its name changes to ‘Jamuna’. Along with River Ganga, it forms the largest delta in the world, that is biggest Mangroves vegetation region in the world. 23. River Indus - Originates from the Mansarovar Lake in China and after passing through India flows into Pakistan. It drains into Arabian Sea and forms delta. It forms deep gorges throughout its mountainous parts. Shyok, Jhelum Chenab, Ravi, Beas, Satluj, Gomal etc., are its major tributaries, ‘Mangla Dam’ in Pakistan is constructed on this. 24. River Meander - River flowing in Turkey which follows highly zigzag path due to which it forms meanders. Along its path it form narrow valley and gorges.